Small Block Chevy V8 Monza & Vega Style Exhaust Headers. 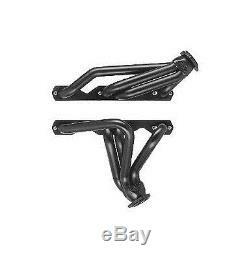 This is a Brand New set of plain steel CC13 inside frame rail header designed to fit Chevrolet Monza and V8 Vega applications using the small block Chevy engine. Check out our store for the other coating options. The vehicle's steering shaft will run between the engine block and header on this application. The use of solid motor mounts, engine plates, or the installation of a torque limiter is strongly recommended to prevent the engine from shifting would may cause the steering to bind. Comes with all hardware necessary for installation. Engine : Small Block Chevy 265-400 Primary Tube Diameter : 1½" Collector Diameter : 2½" Weight : 17 LBS / 7.71 KGS. 16-Gauge Primary and Collector Tube Thickness. Patented Flange Design Requires NO Gaskets. Do Not Attempt To Use Flange Gaskets! The raised flange on the Sanderson Headers will buckle the gasket during tightening and actually cause a leak! Emissions legal on pollution-controlled motor vehicles. It is the purchaser's responsibility to verify local regulations for compliance. The best thermal protection for your headers is our Aluminized Ceramic Coating that is available for every Sanderson Header. When sitting in driver's seat and engine in front of you, the LEFT header would be the Driver's Side on LH drive vehicles; coincidently, means the RIGHT header is on the passenger side. See the detail image that describes engine sides. Please wait for us to send you a combined invoice before paying. We have discount prices on thousands of parts for your Street Rod, Hot Rod, and Custom Car or Truck. Parts are added to our store daily, so check back often for the latest deals! Plus, we have access to thousands of parts that are not listed. We do get hundreds of emails daily, so at times it may take us up to 72 hours to respond to your emails. The item "Small Block Chevy V8 Monza & Vega Style Exhaust Headers" is in sale since Monday, July 09, 2012.